Brush codes are a textual based description of a brush that can be exchanged others as an easy way to share brushes. It is never necessary to understand any of the brush code. The codes are just an exchange mechanism. 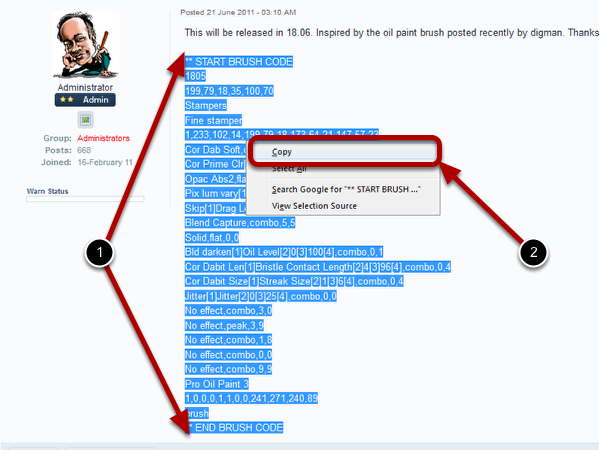 Select the Text of the brush code from the line **START BRUSH CODE to ** END BRUSH CODE. Press CTRL + C (standard Windows copy shortcut) or right click and select Copy from the popup menu. Right click on the Brush Shortcut that you want to import the brush codes into. Note: The existing brush at that shortcut location will be overwritten. 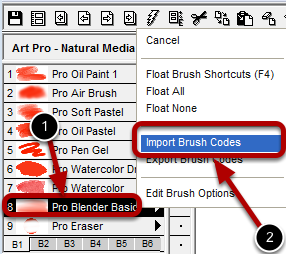 Select Import Brush Codes from the popup menu. 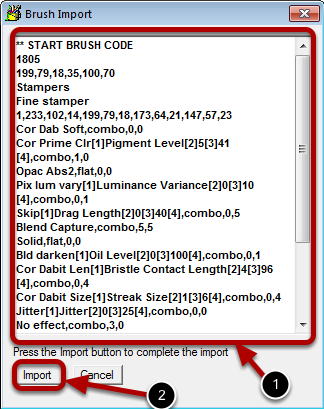 The brush codes from the Windows clipboard is automatically pasted into the edit area. There is nothing you have to manually do.